Today I got an interesting briefing about a Lancope, this company provides network monitoring that utilizes netflow version 9 and sflow. The products are in appliance or virtual machine. The entire monitoring architecture comprises StealthWatch Flowsensor, StealthWatch FlowCollector and StealthWatch Management Console. Each of these components is an appliance or virtual machine. The flowsensor is deployed to monitor network devices that do not have netflow support, the idea is to place the flowsensor’s monitor port to the port-mirrored destination port of a switch, the flowsensor then convert the raw data into netflow version 9 format and send netflow to the flowcollector, management console then retrieves the netflow information from the flowcollector and tabulate the information into the dashboard to correlate items. I have a StealthWatch Flowsensor1000 with me and tested it on PRTG. PRTG does have a netflow collector that supports version 9. This entry was posted in General stuffs and tagged lancope, netflow, netflow version 9, prtg, stealthwatch flowsensor. Bookmark the permalink. 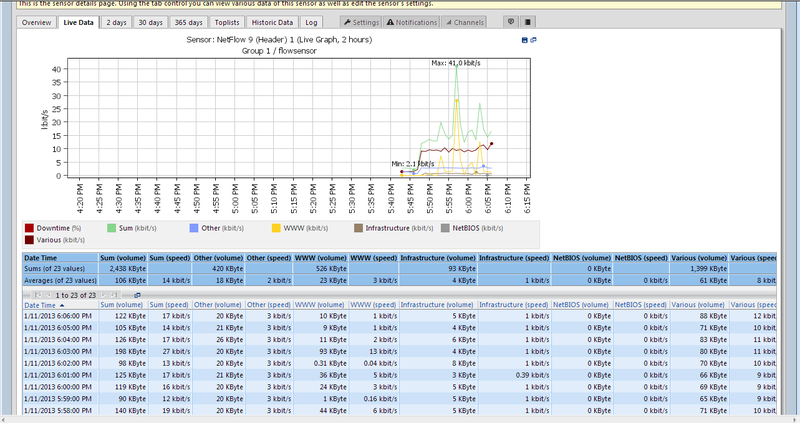 In a normal Netflow 9 enviroment the data flow is not realtime, data is only send when the session ends. How does the StealthWatch handles this data flow when it´s comming from a non-netflow device/port? Do data look more like realtime statistics without any spikes? Hello Robert, this is the first time I use this product and it is not complete without the StealthWatch management console which is at the actual site. The general idea is for flowsensor to receive raw packets from the port-mirrored destination port and send the converted netflow version 9 format to the flowcollector. So perhaps I can find out when I deploy this at the site to be used together with the management console.